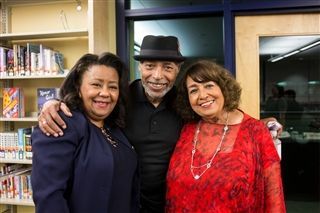 Amde Hamilton and Dee Dee McNeil, of the legendary spoken word group The Watts Prophets, recently appeared on the Windward campus for a week-long series of speaking events and classroom visits to share their worldly wisdom and poignant poetic talents. 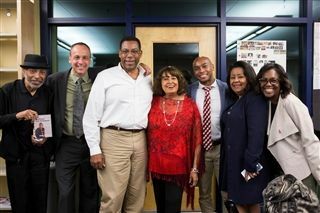 From the soaring space of the Windward gym to intimate learning spaces, the charismatic guests captured the attention of students and faculty alike. To communicate the impact of this visit in the present, it’s helpful to step back to the past. Formed in the late 1960’s, the LA-based Watts Prophets were a trio of poets and vocalists composed of Richard Dedeaux, Otis O'Solomon, and Amde Hamilton. Working with collaborator DeeDee McNeil, the group’s Jazz-inspired rhythms, socially relevant lyrics, and poetic delivery paved the way for many of modern rap and hip hop’s biggest artists. On their first day at Campus, Amde and DeeDee took the floor in the Windward gym before assembled students and faculty members. After some brief words, the two proceeded to fire up the musical talents which put the Watts Prophets on the cultural radar in 1967. Amde delivered a fluid flow of sage poetic rhymes while DeeDee’s golden voice took wing, complimenting her partner’s performance. The air was glowing with soulful energy and the audience offered up raucous applause at the performances conclusion. That same day, a follow-up lunchtime learning session allowed students an opportunity to engage in Q&A with Amde and DeeDee who regarded the students initial silence with warm amusement. But with a combination of knowing smiles and encouragement, the two soon had their audience asking questions on a variety of topics, from the state of modern music to the role of the internet in today’s society. 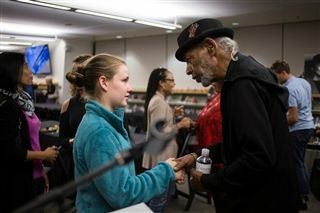 By the end of the talk, both speakers and listeners had made positive impressions on one another with more than a few students approaching the pair in person to offer their thanks. Over the next few days, Amde and DeeDee featured in a series of speaking engagements and poetry-focused workshops around the Windward campus. With each appearance, the wisdom of an older generation was passed along, inspiring students to find their own voice as they rapidly approach a greater world ahead of them. 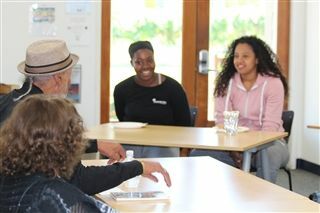 The culminating event of the week was “Conversations and Connections” on Oct. 19 as part of Windward’s annual Fall Welcome. Members of the community got to know one another over dinner before settling in for a panelist discussion featuring Amde and DeeDee. Moderated by Vida Brown, the audience engaged in spirited back and forth with the panelists mirroring the lunchtime learning session with students just a few days prior. 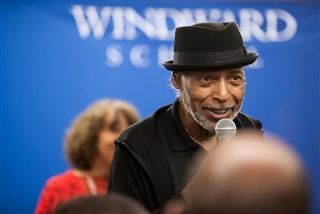 Click here to view photos from Windward’s Fall Welcome.